Shokoohi pulled his Vscan, a handheld ultrasound device, from his pocket and conducted a quick chest and abdominal scan; he found significant intra-abdominal bleeding with clotting and possible splenic rupture. Shokoohi shared the images with a local surgeon and a volunteer surgeon, and they rushed the patient into the operating room for an emergency laparotomy. She survived. Shokoohi’s anecdote – one of many that both he and his colleague, Keith Boniface, M.D., chief of ultrasonography and associate professor of emergency medicine at SMHS, share – highlights the health disparity between the United States and developing countries. “Opportunities for a healthy life are not equally distributed across the globe,” Boniface said. In an effort to balance the scales, GW joined forces with Global Health Service Partnership (GHSP), a collaboration between the Peace Corps, the President’s Emergency Plan for AIDS Relief, and non-profit Seed Global Health. GW’s role, explained Jim Scott, M.D., professor of emergency medicine at SMHS and senior advisor for medical education at Seed Global Health, is organizing the program participants’ medical orientation and training in collaboration with the Peace Corps. During a two-week intensive session in Washington, D.C., the mix of volunteer doctors and nurses learn about infectious diseases, safety and security, and the culture and health conditions of the three participating countries, Malawi, Tanzania, and Uganda. The group then travels to Africa, where they receive additional training before assuming year-long faculty roles in medical and nursing schools. The GHSP program is now in its third year of sending volunteers abroad. 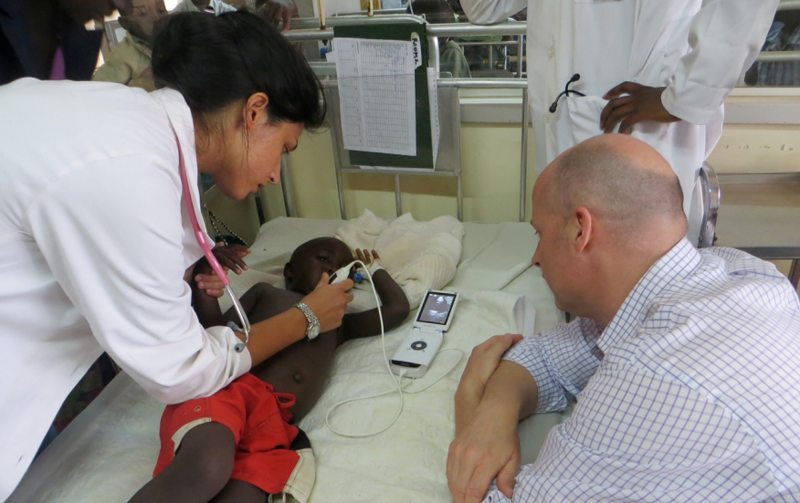 Since 2014, the GE Foundation has partnered with Seed Global Health to equip GHSP volunteers with Vscan devices for diagnostic use and training purposes. GW, in response, has incorporated additional ultrasound training for the volunteers. Scott turned to “the smartest point-of-care ultrasound guys I know,” Shokoohi and Boniface. Twice, the doctors led training in the United States before heading to Africa to complete an additional round of training. It was there, they say, their scope of experience widened. “My experience with GHSP volunteers during these trips with local professionals was absolutely profound,” Shokoohi said. As the doctors explained, the Vscan made an immediate impression on diagnostics. As a small device that runs on battery power, the scanner allows medical facilities to bypass the challenges of expensive, bulky equipment that requires maintenance and steady electricity. “This device is not the most advanced, but it’s the most available, accessible device for the providers,” Shokoohi explained. While the Vscan doesn’t provide the comprehensive imaging of a larger machine, its convenience allows medical workers to speedily attend to patients. In the two visits Shokoohi and Boniface made to Africa, they witnessed – and were part of – the pivotal change the Vscan provided, particularly with HIV- and tuberculosis-related diagnoses. Shokoohi and Boniface both say that their time in Africa has shaped their view of medicine, particularly when it comes to the lengths the local doctors and nurses go in caring for their patients. GHSP may expand to additional countries and disciplines in future years, said Scott and Fitzhugh Mullan, M.D., Murdock Head Professor of Medicine and Health Policy at the Milken Institute for Public Health at GW and founding board chair and senior advisor for Seed Global Health. The expansion will likely allow the education and training GW and its professors provide for their African counterparts and the volunteers to spread. GHSP is now accepting applications for 2016; visit http://seedglobalhealth.org/apply for more information.